Our partners at ClickStay.com have many rental properties available at Condado de Alhama listed with Special Offers and great discounts. We found two penthouse apartments with golf course views, air conditioning and parking for just £159 for a one week stay for 2 adults and 2 children. This offer is for dates either between 20th October and 27th October or from the 27th October to the 3rd November. If you prefer a garden apartment then for just £160 you can book a two bedroom top floor apartment, with roof terrace, and close to the sports facilities and Condado Club cafe bar. We found this offer for the 20th October and 27th October only. For those who can extend their holiday to a fortnight then many two bedroom apartments are still available for as little as £318 or £356 for a three bedroom ground floor apartment. Rentals on La Isla, the private island at Condado de Alhama, are available for just £320 for the same period. Many of these properties can be booked instantly via the website so you have peace of mind that your holiday apartment is booked and waiting for you! Do remember that in most cases an additional cleaning fee is payable plus a refundable breakage deposit. Even with these extras booking a holiday apartment at Condado de Alhama offers great value for money in a fabulous location. The resort has an 18 hole Jack Nicklaus golf course on site, is just 20 minutes away from beautiful blue flag beaches on the Costa Calida and 20 minutes from the adventure of Sierra Espuna. If that is not enough, then the region of Murcia is packed full of interesting places or history and culture just waiting to be discovered. 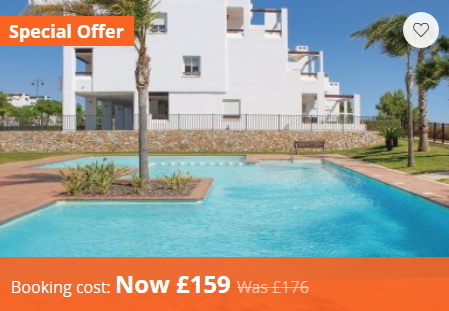 So, if you would like to bag a holiday bargain to Condado de Alhama for the half term school holidays, head over to ClickStay and find your perfect family holiday apartment. For an additional discount, sign up the the newsletter and get another £10 off your first booking! Every Friday in May Is Steak Night At Big G’s!